The most accepted opinion is that the Rebellion or the Eighty years war starts with the ransacking of churches and convents (Beeldenstorm) in 1566. The cause of this uprising can be found in the bad economic position of the common people and the oppression of the new calvinistic religion. This oppression was policy of king Philip II of Spain who also ruled the low countries. The result of this outburrst of violence was that the breach between Catholics and King on one hand, and Calvinists together with unsatisfied noblemen who demanded freedom of religion on the other, was unrepairable. The last were lead by William the silent, Prince of Orange. To crush this rebellion Philip II send a new governor to the Netherlands: Ferdinand Alvarez de Toledo, Duke of Alva, who began very energetic on his new task. On the day of his arrival he installed a new court of law: The Blood Council (De Raad van Beroerten or Bloedraad) with himself as chairman. This council was famous for its many harsh sentences. He also had two leaders of the rebellion imprissoned and sentenced to death by decapitation: the count of Egmont and the count of Hoorne. Alva also created new taxes, a new criminal code, garrisons in major cities and he supported the inquisition. William of Orange wasn't idle either. He invaded the low countries several times with a mercenary army. Due to a lack of money and little public support these invasions were doomed from the start. There rebels were not entirely unsuccesfull. The "Watergeuzen" had captured the harbortown of Den Briel. These sailors were a colourful lot of people. The fleet consisted out of noblemen, scientists, merchants, fishermen, craftsmen and riff-raff from every region of the Netherlands as rank and file. William the Silent made use of these seamen as privateers. The fall of Den Briel or Brielle was the first in a row of several cities mainly in Holland and Zeeland. These cities created a government (De Statenvergadering in Dordrecht 1572) with on its head William of Orange as stadtholder. The Spaniards also had their successes, but the war was costing huge amounts of money. Therefor peacenegotiatians were started but whad to fail from the start. In the meantime Alva who did not like the low countries and its wet climate at all had asked several times a relief of his duties. Philip in the end gave in and appointed in 1573 Don Louis de Requesens as new governer. 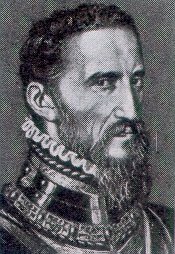 This Requesens died suddenly in 1576 and with no successor the serious discontent of the Spanish troops which had not had payment in months became visible. They started a mutiny. Many civilian would meet his end in an encounter with these troops. To end this mutiny a treaty was signed (Pacificatie van Gent) The Government came in hands of the States of the districts and the States General, royal troops had to leave the country and religious persecution had to sease. In Holland and Zeeland the church stayed reformed in a calvinistic way and had to be recognized by others. This treaty could not work out right. The King in Spain never would recognize religious freedom and he never would give up power in favor of the States General. Protestants also were not satisfied they wanted to be the calvinistic church to be the only one. When Spanish troops returned the treaty was cancelled. In the meantime William of Orange grew more powerfull. He united some districts in a union: De Unie van Utrecht to continue the struggle for freedom of religion and parlamentary power. The new Spanish governor Alexander Farnese, duke of Parma made alliance with the States of Henegouwen and Artesië the so called Unie van Atrecht. In 1584 William of Orange was for the second time assasinated. This time it would be succesfull. The assasin Balthasar Gerards was sentenced to death. His skull would be kept as a relic. His family was raised to the peerage. The military genius of Parma and the conservatism of the majority was the key to Parma's great succeses. In the years between 1579 and 1589 he restored royal authority and the Catholic religion in all districts south of the major rivers and in great parts of Overijssel, Drenthe and Groningen. But the States General had terminated their loyalty to Philip II. But with no leader (The prince of Orange was dead) they had to seek help at foreign courts. This help from France and England only lead to new conflict. Therefore the Netherlands developped into a confederation of seven sovereign districts: The Republic of the United Netherlands (de Republiek der Verenigde Nederlanden). The Republic and England were immediately threatened by the Spanish Armada. This was a huge Spanish fleet that had to pick up soldiers under Parma to invade England. Now for the first time the Republic had a useful army, lead and reorganized by Maurits son of William of Orange, and a powerful navy. Both were supported by a powerfull government lead by Grand Pensionary (Raadpensionaris) Johan van Oldenbarnevelt. He also took the initiative to found the Verenigde Oostindische Compagnie (V.O.C.) This company organized the newly established trade with the East. Later this would mean huge profits. On land the offensive was taken and step by step Maurits captured (fortified) cities outside Holland that were garrisoned by Spanish troops (1590 - 1597). Now the Republic was a force that had to be recogned with. France and England signed in 1596 a treaty thereby officially recognizing the Republic as an independant nation. In spite of Philip's death in 1598 the war went on. The Republic was strong enough for a maritime war with resulted in a complete victory of Heemskerck at Gibraltar in 1607. In 1609 a peace treaty was signed: Het Twaalfjarig Bestand ( the twelve year truce) which de facto recognized the Republic. The trade routes to the East could be develloped., altough these were not part of the truce. After the truce Spain renewed her efforts to subdue the Republic which was weakened by internal conflict and the death of Van Oldenbarnevelt. But in 1622 Maurits' brother Frederick Hendrik started a campaign to conquer cities in the South and East. The navy had aslo its succes. Tromp destroyed the second Armada at Duins (North Downs) in 1639. In 1621a new company was founded: the "Geoctroyeerde Westindische Compagnie (G.W.C.) This company mostly directed its activities at privateering. The most famous admiral of this company was Piet Heyn. With his 31 ships he entered a Spanish silverarmada of 20 ships. The worth of the loot was approximately 14 million guilders (7 million dollars). In the last thirty years the Eighty years war coincides with the Thirty Years war. German emperial troops helped the Spaniards and the German protestants were supported by the Republic. Both sides wanted peace. This was established and signed at Munster (1648). The result was the independancy of the Republic from the Spanish and the German empires. All conquered territory could be kept. The river Schelde was closed for ships which resulted in the growth of northern cities like Amsterdam. In the East- and West Indies a status-quo was kept.